Option: 6-inch color LCD Display with Touch Screen Operator Interface, alarm history, and local trend recording. Alternate Energy Systems offers a complete line of circulating-hot-water vaporizers in capacities from 200 gallons per hour to 3000 gallons per hour.The heat exchanger tube bundle is of multi-pass design to transfer the maximum heat to the liquid. The tube bundle and all propane piping conform to Section VIII, Division I of the latest edition of the ASME Boiler and Pressure Vessel Code. The pressure vessel carries the ASME ”U” stamp and is National Board registered. 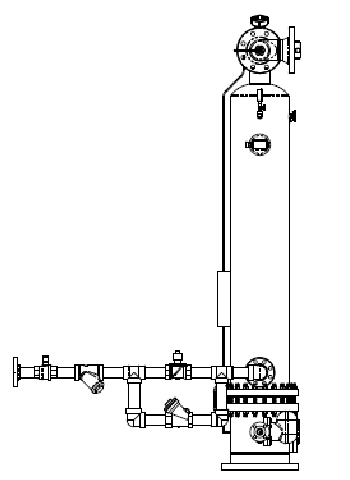 VWB vaporizers in standard configuration include temperature regulator; dual liquid carryover protection through ultrasonic liquid level transmitter in the pressure vessel, and “smart” liquid carryover protection with Rosemount pressure transmitter and temperature transmitter in the vapor outlet; and liquid inlet valve. Temperature gauges in water inlet and outlet, and in pressure vessel shell and vapor outlet, are standard. Vaporizer design, wiring, controls, and electrical components and their installation comply with the latest editions of NFPA #58 and NFPA #70.